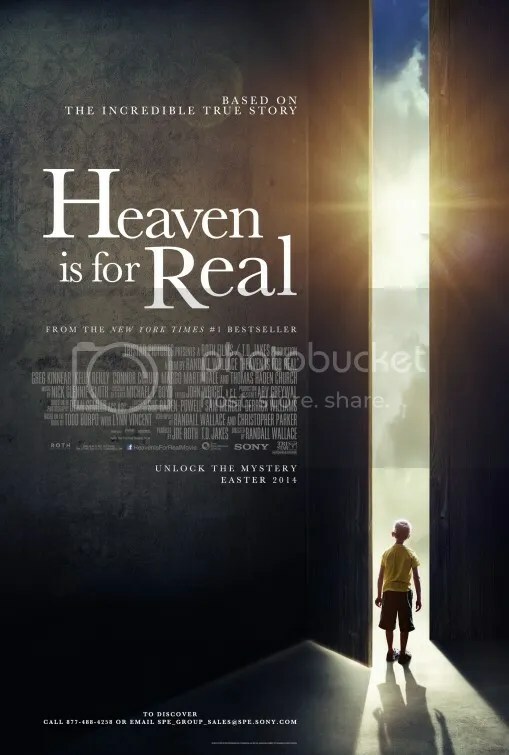 Heaven is for Real is a well meaning drama about parents with a child who has a near death experience. Four-year-old son Colton suffers from an undiagnosed ruptured appendix. After father Todd Burpo takes him to the hospital, Colton claims to have visited heaven and comes back to testify about what he saw. Giving his story validity is the details of what his parents were doing while he was on the operating table in a completely separate room. He also gives other extraordinary details of past events in his parents’ lives that were heretofore unknowable to the little boy. With one exception, the performances don’t extract much emotion from the audience. Little actor Connor Corum is a beatific little tyke with blonde hair and blue eyes. He’s certainly cute but he doesn’t quite register the personality it takes to anchor a film like this. He’s a bit of a blank slate. Much better is Greg Kinnear as his father. He perfectly embodies everything this part requires. He is likable, sensible and sympathetic. He expresses the kind of genuine excitement tempered with doubt that a real parent would have in this situation. The biggest issue I had with this story is the Christian church’s reaction to the little boy’s message. Todd Burpo doesn’t quite know how to explain what his child has seen or knows, but at least he registers some happiness. As a pastor of Crossroads Wesleyan Church he has an audience to which he can recount his son’s visions. You’d think the members of a Christian church would embrace such news with open arms but such is not the case. Leading the opposition is Nancy Rawling as portrayed by Margo Martindale. She worries that his account will turn their parish into a circus. I had to wonder. Is that a problem? The added attention could be a wonderful jumping off point for a parish to discuss the hereafter with believers and non-believers alike. Instead the boys stories become a worrisome thorn in the side of everyone from Todd’s wife (Kelly Reilly) to his close friend (Thomas Haden Church). Only Todd Burpo, his father has the desire to explore further. Heaven is for Real is based on the non-fiction book of the same name by Todd Burpo and best selling conservative writer Lynn Vincent. It was a true story so maybe the negative reaction that Connor’s chronicle received from the congregation at the time was what actually happened, Yet it was a #1 New York Times hit so it obviously touched a lot of hearts outside the religious world. The boy’s experiences should prompt more probing questions. He saw Jesus for goodness sakes! At least he believes he did, why aren’t people in the Church more excited? Regardless of your personal beliefs in the afterlife, it seems like this bestseller should have inspired a more uplifting tale. This could have been the seed for a galvanizing discussion that Christians, non-Christians, atheists and agnostics could have regarding the concept of heaven. The 1977 picture Oh, God! dealt with this subject in a much more innovative way. In contrast here we are nearly 4 decades later and we’re presented a fascinating story that is handled in the most utterly routine fashion. It doesn’t probe enough to inspire the faithful, the skeptics or anyone in between. This entry was posted on April 16, 2014 at 8:00 pm and is filed under Drama with tags 2014. You can follow any responses to this entry through the RSS 2.0 feed. You can leave a response, or trackback from your own site. It take a very long time to get to this part, but the little boy does finally recount events that no child could possibly know. That gives his visions validity. This is a fascinating story. The movie just didn’t handle it properly. I have not seen the movie, but have read the book. I gather from your review that the movie took a different angle than the book. Actually the book took the boy’s experience very seriously. It was written by the father of the boy and is classified as non-fiction. The book tells how the father gently questioned the boy without suggestions from himself. The people of his church mostly accepted the boy’s experience and found much comfort on many points. I am definitely a Christian for whom Heaven is very real because God is very real. I found some of the boy’s comments to differ from my expectation of what Heaven is really like. However i was impressed with information the boy had that seemed hard to explain. He knew more of Biblical references to Heaven than most adults get from many years of Church attendance. It seemed also significant he was knowledgable of his parents conversation in a separate room of the hospital during his operation. After reading the book I felt sure the boy had either actually visited Heaven or most certainly had had a Heavenly vision as real as prophets of the Old Testament. The movie treats the boy’s experiences seriously, but the doubts of the congregation seem to be manufactured for the sole purpose of conflict – in essence to make a movie. It would seem to me that the parish would take the visions of the little boy as evidence that their beliefs are indeed correct. Instead we spend most of the move watching people of faith having a difficult time grasping what they already believe to be true. The father is different though. He seems excited by what the little boy is saying. Obviously given that title, the movie ultimately affirms the little boy’s story. This sounds really neat, until you realize it was a true story. I have to feel like (particularly after the trailer) this is a really stupid movie, and the characters all made me roll my eyes in the trailer. I know people who read the book and wanted to see the movie. Both, I believe, wanted me to see it first, and I’m just not sure I can do that. This seems so targeted at Christians and yet Christians reacted negatively, apparently. Good review Mark. The title clues you in on the story’s ultimate point of view. But to get there we have to watch Christians getting upset with the little boy‘s story. That would make sense coming from the media but not the believers. An odd tale. I was so excited about seeing this movie. I loved the trailer, and thought, this was gonna be good. Although it was good, it lacked real excitement. I was let down at the end. The acting was very good, but I have to give it a only 3 stars. It seems to have touched a cord in the U.S. It looks to earn about $70 million. That’s on a $12 million budget.